Saint Gregory who was from Irenopolis of the Decapolis of Asia Minor, was the son of Sergius and Mary. He became a monk as a young man, and after struggling for many years in virtue and prayer under obedience to a wise spiritual father, he was informed by revelation that it was the will of God for him to live, like the Patriarch Abraham, with no certain dwelling, moving from place to place. His journeyings took him to Ephesus, Constantinople, Corinth, Rome, Sicily, Thessalonica, and again to Constantinople, where, after many labours in defence of Orthodoxy against Iconoclasm, he reposed in peace in the first half of the ninth century. He had two disciples, one of whom was Saint Joseph the Hymnographer (see Apr. 3), who wrote the Menaion service for Saint Gregory, his father in Christ. 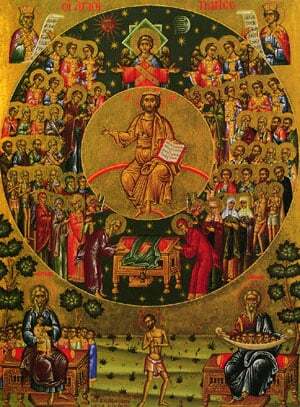 Share the feast of Gregory the Righteous of Decapolis with an icon greeting ecard.